I have been volunteered to create a very very brief Hiveside guide for beginners. The purpose is a quick reference to support beginners during inspections. Swarm control without finding the queen. Does anyone have any suggestions of what we should add? Ideally we are talking about an A5 side and mostly diagrams and images. I might find Making Decisions useful but that's always been my problem. What about: Gentle/Appropriate handling and monitoring the agitation of the colony? A guide would include a soft approach, a little smoke if the colony is expected to be aggressive, appropriate PPE (I like long cuffed nitriles), slow and steady movements above the frames, create space by removing dummy or end frame, straight vertical lifts to avoid rolling or crushing, smoking edges of boxes to chase bees when reassembling, diagonal or just off-centre positioning (then sliding) of boxes going back on. The various warnings bees give us - all eyes up, jumping on hands, higher pitched buzzing, bees in face or searching for gaps at sleeves/gloves, full blown bee armageddon nightmare. The warnings of approaching swarm preparations - drone brood maturing, shiny queen cups, eggs in Q cups, bees searching for nesting sites, larvae with Royal jelly. But that's just a modification of your queen cell timing/staging. 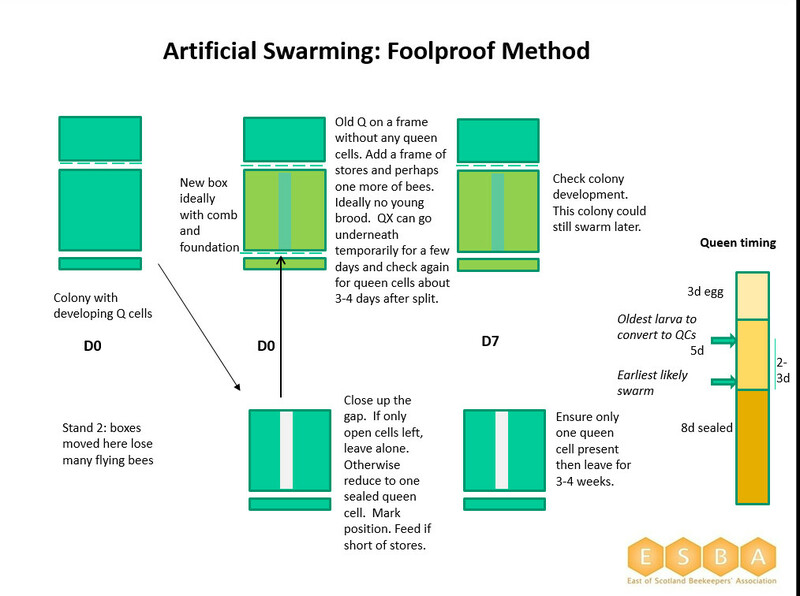 If you'd like a graphic of the basic artificial swarm procedure (the one some people call the Pagden though that is really just one variant) then you can have it. Here is a JPG but you can also have a PPT with or without the ESBA logo if you wish. Remember - leave one QC only unless you have done something to seriously deplete the box of flying bees (or are using your beginners to generate swarms for your bait boxes!). Sorry i should have been clearer, A5 page per subject! We are looking for around 20 pages. Gavin, the suggestions on handling are good. I'll see what i can add before i circulate it. It would be very easy for us create yet another manual but we are looking for something more like an aide memoire for quick reminders. Assessing Varroa infestation level? Floor counts are not that reliable but can be a rough guide (high counts are a warning, low counts not to be relied upon). Drone brood checking or sugar shakes better - the guide could point to treatment threshholds. Discriminating chalkbrood, sac brood, foulbrood? Interpreting waggle dances? More for interest than essential management. Gavin, thanks for the suggestions. I think Alan r has a lot of that stuff in the course handbook which is clearly a lot bigger and more detailed. Hive diseases sounds like a good option if i can get some good open source images. You are welcome to the photos of EFB and AFB I posted on here. I also have an image of sacbrood and chalkbrood can be easily obtained. Thats a great idea to create a guide.Will you be posting it. Thanks Gavin. Very much appreciated. Greengage, yes our intention is to put it up on the association website for all to use so I'll link it when done. I think we will dry run it with our new course to see if it does what it needs to. If anyone wants to be in on the draft review please let me know your email via a private message.